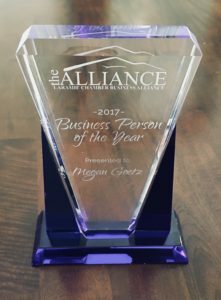 February 15, 2018 (Laramie, WY) – Megan Goetz of Pence and MacMillan law firm was awarded the 2017 Business Person of the Year Award by the Laramie Chamber Business Alliance (LCBA). The Business Person of the Year Award honors and celebrates exceptional service by an individual who has positively contributed to the quality of life in Laramie. That individual has consistently demonstrated a high level of community involvement through participation in civic, community, and active leadership roles for employees, peers, and citizens of Laramie. Judging criteria for the Business Person of the Year Award includes leadership in a local business, consistent involvement in service to organizations, having an extended period of continuing service and community involvement, and demonstrating positive contributions to the Mission and Vision of organizations.